2007-08 FRESHMAN: You are expected to use the material at this website. There will be future bonus questions over some of the material offered. Follow links that interest you. It will be to your benefit. Links with a "*" in front are especially important. Taking notes from these websites can prove very helpful. Below are a number of websites that may be of interest to elementary, junior high, high school, and college age students. Teachers may also find some of the links quite useful. Many include information that can be helpful with science related projects. Be sure to check this page often for the latest links and information. The freshman at NHJH spend about an hour on Wednesday, 5 October 2005 listening to an outstanding presentation by a member of the MAKING HIGH SCHOOL COUNT organization. Parents are encouraged to visit with their children about the presentation. The freshman class this year will probably have the same presentation later this year. Also, a link to their website can be found below. Click here to go to the MAKING HIGH SCHOOL COUNT website. The websites given below can be extremely helpful to students in Mr. Miller's freshman biology class. Information obtained at the sites can help with daily lectures and reading assignments as well as with the Earth Day projects. All students in Mr. Miller's class are expected to spend some time exploring each of the websites. Notes over the material covered at many of the sites are highly recommended. Click here to go to a website dealing with cell biology. This site can be extremely helpful to students in Mr. Miller's freshman biology class. It also contains sample test questions. * Click here to go to a website dealing with cells and organelles. This site can be extremely helpful to students in Mr. Miller's freshman biology class. Click here for the "biology4kids" webiste. It is another site that can be very useful for all freshman biology students at NHJH. Click here to go to an excellent website dealing with nature in your own backyard. This website has information for both students and teachers. * Click here to go to a website dealing with photosynthesis. This site can be extremely helpful to students in Mr. Miller's freshman biology class. This link will take you to a website that allows you to explore THE SCIENTIFIC METHOD. It is an excellent site to visit for a better understanding of how science works. Click on this text to go to the EXPLORE EVOLUTION website. Click here to go to Mr. Miller's original website. There are dozens of links to other science related websites from Mr. Miller's original website. * (VERY IMPORTANT) Click here to go the the Great Plains Nature Center website. This website is probably the most informative in regard to the flora and fauna of Kansas on the Internet. It is an excellent resource for Earth Fair projects. What is a species? Click here for some helpful informaiton. Click here to go to main USD 345 website. THE CENTER FOR NORTH AMERICAN HERPETOLOGY maintains a directory of herpetologists with more than 1000 entries from herpetologists from around the world complete with their websites and email addresses. This is an excellent resource for anyone that is doing a project involving herpetology. Click on the link below. Click here to go to the DIRECTORY OF HERPETOLOGISTS. Northern Hills Junior High students have been involved with the Kansas StreamLink program since 1991. They often conduct field trips to Indian Creek and have collected data from some of their field trips that has been used by the StreamLink program. Click on the link below to learn more about the Kansas StreamLink program. Click here to go to the Kansas StreamLink website. Click here to view some of Mr. Petersen's biology students in action! Click on this text to go to a site featuring photos taken by one of Mr. Miller's first hour biology students during September 2004. Learn how you can create your own website at this location. Click here to view some photos from the 12 September 2004 optional field trip with a Washburn University herpetology class. Click here to go to GOOGLE. It is an excellent search engine that can be very helpful in biological research. Learn how to use the advanced search for the best results. Click here to go to a web page with information about the order "Coleoptera" and find information that should be helpful when you study some species of insects. 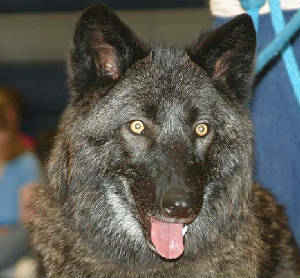 Mission: Wolf visited NHJH during November 2003. Students and adults are still talking bout the visit! Click on the photo of the wolf below to go to the official Mission: Wolf website. The link below will take you to a page that was first created in August 2005. Many of the images relate to the 2005-06 NHJH freshman biology classes. Click here to go to a special photo page of NHJH science related photos. The link below will take you to an excellent website dealing with Charles Darwin, evolution, natural selection, and its scientific history. Click here to go to a DARWIN AND NATURAL SELECTION website. Click below for a timeline of evolution. EVOLUTION is the basis for modern biology. Click on this text to go to an updated website that gives detailed information about the history of our planet and the evolution of life on our planet.